I’m writing this now because the “Bolt” is available from Verizon for less than $50 with a new two-year contract. Comparable phones are a lot more. There might be a temptation to spend the extra bucks or wait until they come down in price, but that’s hardly necessary, as you’ll see. I’ve had my Thunderbolt for about four months. I’m actually on my second, because I discovered on this summer’s trip to the High Plains that they don’t do well when falling onto concrete from the seat of an Explorer, even with a protective skin. The screen didn’t break, but its spirit departed instantly. I took it to Verizon and had a new phone the second day, via FedEx. Popped in the SIM and SD card, downloaded my backed-up apps, contacts and tunes, and I was good to go. Ah, the screen! — glorious at 4.3 inches diagonally (about 9-1/2 square inches). I think 4 to 4.5″ is about as big as is practical for a phone. Any bigger and it would be difficult to manipulate with one hand, and would cease to be really pocket-sized. The colors are brilliant, detail excellent. I’ve compared it side-by-side with the iPhone and my old eyes can’t tell the difference, although the numbers make it sound inferior. Numbers aren’t always the answer. I have nothing to complain about, and it’s Gorilla Glass, a Dow Corning product that’s as close to unbreakable as glass gets. The touchscreen works flawlessly. Verizon’s 4G/LTE service is fast enough. There may be other providers with service that is faster — again, on paper — but it’s like a Bugatti Veyron v. an Audi R8. The numbers sound good, but how fast do you need to go, really? I get consistent download speeds equal to or greater than my home DSL, peaking under ideal conditions at about 14 Mb per second. Folks, that’s fast. That’d outdrag a Hemi. And keep in mind that most of the time you’re surfing mobile pages, which are designed for slower service. With LTE, they load in a flash. (Oh yes, we have Flash, too.) As a matter of fact, to save battery life (see below), I usually keep it set on 3G — there’s an app for that. 3G is entirely fast enough for texting and casual browsing. You really don’t need the 4G/LTE unless you’re streaming video but, let’s face it, it sure is fun to open it up when you get a chance. I don’t consider 3G to be a deal-breaker in a phone, but 4G’s nice, and some of the bandwidth restrictions on 3G apply less to 4G. The battery life with the standard battery is about what you’d expect from any smartphone — when it’s on 3G. On 4G, it’s adequate unless you do a lot of surfing. The big display is what loads the battery most, and that’s a constant, but 4G radios use a lot of juice searching for and pulling in weak signals, and pushing data to distant cells. 3G does too, but there’s no question that the faster service, using more bandwidth, also uses more battery. For everyday use, it’s not a problem. For camping in Colorado I used the extended 2800 MaH battery and carry the standard 1400 MaH battery as a backup — but then I’m one of those people who carries two of just about everything. Not a big issue. Definitely a minor annoyance if you’re going to rock the bandwidth, but hey — how much battery life do you get from your laptop or netbook, hmmmmm? And this thing is three times faster than WiFi! Remember, we only call smartphones “phones” for the sake of convenience. They’re really powerful, portable little computers that can make phone calls. There’s a lot of fuss nowadays about CPU speed. I’ll tell you, folks — I’m what you’d call a heavy user, and I have yet to find a situation where the phone’s processor was too slow. The biggest bottleneck in phones (as with any other computer) is memory, and the Bolt’s 768 MB of RAM, 8 GB of internal memory and 32 GB SD card (standard) is simply all you need. I run five or six apps at a time and it never hiccups. 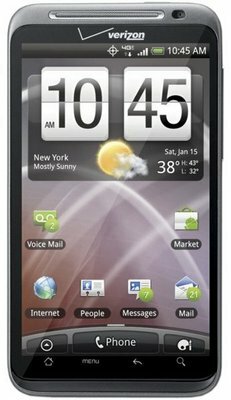 I’d been holding out for a dual-core phone and got disgusted with Motorola’s foot-dragging on the Droid Bionic. I haven’t for a minute regretted getting the Thunderbolt with its 1GHz processor instead. Hell, it’s faster than most desktops were 10 years ago! The advantage to a dual-core would be battery life which, in theory, should improve with two processors, and if you’re going to use a dock to turn it into a netbook. Other than that, we’re talking prestige. I drive a Hyundai, so I’ve got all of that I need. It’s like the fuss about pixel count in digital cameras. The fact is, unless you’re planning on making prints bigger than 11×14, 10 Megapixels is all you need, and in small cameras you give away low light performance when you go much higher than that. That said, the Bolt’s 8 MP camera does good duty on its own, and there are a million apps, including HDR, to tweak it. It’s a phone camera, folks, not a Leica. No one will make a phone camera the equal of even a 200 buck point-and-shoot until someone develops new sensor technology, so get over it. I carry my Pentax DSLR around less than I used to, though; I can tell you that. The 1.3 MP front camera is pretty poor, but it’s for video conferencing and self-portraits with your mates in the bar, so who cares? You can read myriad reviews and specs on the Thunderbolt with a quick google, so I’m going to leave it at this: The Thunderbolt is all the phone I need, and I’m a power user compared to most folks. If I find it isn’t adequate at some point, I’m sure VZW will oblige and upgrade me for a couple of hundred frog skins. In the meantime, I’m not shopping. If you are, you could do worse. This entry was posted in Commentary, Internet, Photography, Social Networking and tagged 3G, 4G, Commentary, htc, Internet, LTE, mobile phones, Photography, Social Networking, thunderbolt on October 2, 2011 by Bill.